Famed photographer Gregory Crewdson will present the inaugural discussion in a series sponsored by the Photography Society of The Nelson-Atkins Museum of Art (6 p.m. March 12). Famed photographer Gregory Crewdson will present the inaugural discussion in a series sponsored by the Photography Society of The Nelson-Atkins Museum of Art. The artist’s talk is scheduled for 6 p.m. March 12 in Atkins Auditorium at the Museum. 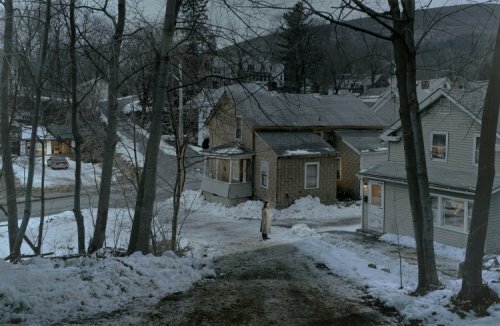 Crewdson’s work has been widely exhibited and reviewed. He makes large-scale photographs of elaborate and meticulously staged tableaux, which have been described as “micro-epics” that probe the dark corners of the psyche. Working in the manner of a film director, he leads a production crew, which includes a director of photography, special effects and lighting teams, casting director and actors. He typically makes several exposures that he later digitally combines to produce the final image. Attendance to the program is free, but tickets should be obtained by calling 816.751.1ART (1278) –(option 2) or online at nelson-atkins.org. The Photography Society was formed November 2007 for people interested in supporting the mission of the Museum’s Photography Department, which includes encouraging the public collection of photographs and expanding public knowledge of art and history of the medium through public programming. Members of the Society first must be members of the Nelson-Atkins at the Friends of Art Associate level with an annual donation of $250 or higher. Membership levels in the Society are $1,250 for the Collector’s Circle and intended for those primarily interested in advice and guidance on developing their own collections. The Curator’s Circle with a donation of $2,500 provides support for the full range of activities to fulfill the mission of the department. All donations are tax deductible. The Photography Collection at the Nelson-Atkins grew from its initial holding of 1,015 prints to a collection of more than 7,500 works with the acquisition in early 2006 of the famed Hallmark Photographic Collection, perhaps the finest private collection of American photography ever assembled. “With that acquisition the Nelson-Atkins instantly vaulted to the top rank of art museums worldwide with major photography holdings. Thanks to continued growth since that wonderful gift, we now have masterpieces from the entire span of photography’s history, 1839 to the present.” Davis said. The Possibilities of Pause: Delaware Women’s Conference 2009 Juried Exhibition	Korean Fever!